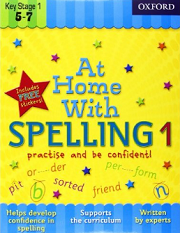 If you have a child in primary school, the chances are that at some point they have brought home a list of spellings to learn. Memorising lists of words comes more easily to some children than others. 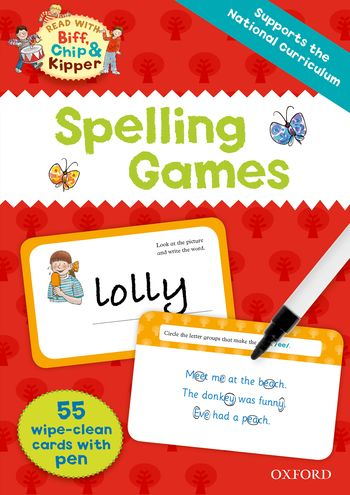 To help equip you with essential information about how children learn to spell at school and to make learning spellings as fun as possible, we've gathered together our pick of the spelling resources on Oxford Owl. Your child will be using phonic skills to spell unfamiliar words and to spell common and tricky words too. Some schools might start spelling ‘tests’ and you will be expected to practise these with your child at home – use board games and online games to make it fun! Your child will be expected to use phonic skills, as well as what they know about word structures more generally, when reading and spelling unfamiliar, common and tricky words. Your child will also now be able to recognize by sight, read and spell many of the common and tricky words. Some schools will send home weekly spellings to be learned. Some schools will send home weekly spellings to be learned. Your child should be able to read and spell unfamiliar and common words using what they know about phonics and how words are structured. Words which are not easily sounded out are learned by sight. Some schools may send home these words to be learned using flashcards so that children can practise reading them easily and at speed. Make it a game! Children will continue to build up a bank of tricky sight vocabulary. What do I do if my child’s attempts at spelling words are just nonsense? In Reception and into Year 1 (P1/P2 in Scotland) children will make useful mistakes in their spelling attempts. It’s an important part of the learning process and is sometimes called ‘inventive’ spelling. So long as the guess has a logic to it, then it shows that your child is learning to use the rules of spelling e.g. spelling hear instead of here shows that your child knows about the ear sound. My child learns spellings every week but then makes the same mistakes in their writing? Don’t worry this is very common. Children can often learn a list of words but then forget to apply what they have learned in their writing when they are thinking about the creative content of their work! It’s just a question of reminding them (sometimes), and also providing opportunities to point out examples of the word in a context. You can also play games to ‘test’ them in a fun way. Car journeys are great for this quick-fire type game. Read our blog post Five creative ways to help with spelling homework for ideas to help your child learn their weekly spelling test words and enjoy it in the process. 1. Spot letter patterns in words. Ask your child to point out words that look like they should rhyme but don’t: home and come; do and no. And words which do rhyme even though they look different: come and sum; there, bear, hair. This will help with their writing too. 2. Play word/spelling games like Junior Scrabble, Bananagrams and Boggle to focus on blending letter sounds to make words. 3. Write a word out – it could be a word from the weekly spellings list – cut it up and ask your child to put it back in the correct order. 4. Use flashcards to help your child remember the weekly spellings and/or write the words out: look, say, cover, write, look back to check it! 1. Help with spelling. If your child is unsure about how to spell a word, encourage them to sound the word out and write the letter or group of letters (the grapheme) that represents each sound (the phoneme). Then they will realise that they know how to spell some, most or all of the word and you can help with any tricky bits as needed. 2. Play games. Many games are really useful for developing the skills that children need as developing readers. You probably already have a host of really useful games in the cupboard, so dig out the Scrabble, Bananagrams, Boggle or a crossword, to name just a few. 3. Play around with anagrams to help with patterns and spelling, e.g. make as many words as you can out of Constantinople (1697 apparently!). 4. Do simple crosswords. Do simple crosswords with your child using a dictionary to help you. The dictionary tells you what type of word you have looked up (verb, adverb, pronoun, noun etc. ), and you can share this with your child. If your child is unsure about how to spell a word, encourage them to sound the word out and write the letter or group of letters (the grapheme) that represents each sound (the phoneme). Then they will realise that they know how to spell some, most or all of the word and you can help with any tricky bits as needed. Charlotte Raby has been a teacher for over 16 years. She is now a teacher trainer and works with schools to help them improve the teaching of all aspects of English, including grammar. In these videos she explains how we can support our children's learning at home. 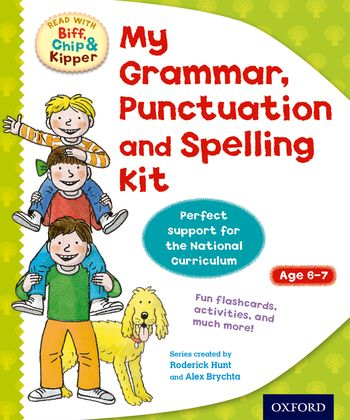 How can I help my child with grammar, punctuation and spelling? 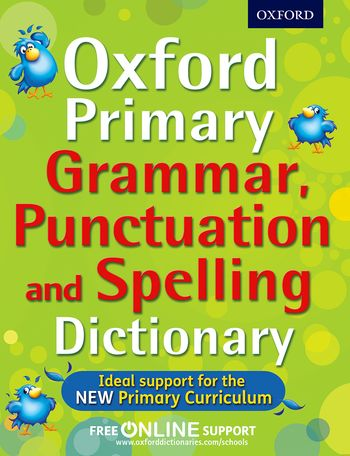 What is the English grammar, punctuation and spelling test at the end of Year 6? These wipe-clean flashcards with pen are a fun way for children to develop their spelling skills, and they support the way children are taught to write at school. A fun activity workbook for children, aged 5 - 7 years, to do at home. This first book focuses on recognizing vowels and consonants, recognizing syllables, prefixes and suffixes, and developing strategies for remembering how to spell hard words. Comes with stickers to reward your child! 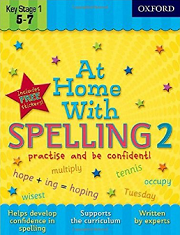 This second book helps further build you child's confidence, focusing on recognizing common word structures and spelling patterns, knowing when to use double consonants, long and short vowels, and decoding unfamiliar words. The essential primary guide to grammar, punctuation, and spelling. 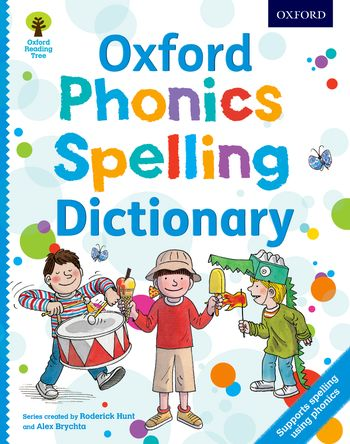 In full colour, it has easy-to-use rules and help, plus an alphabetical list of the tricky, and everyday, words including those most commonly misspelt. 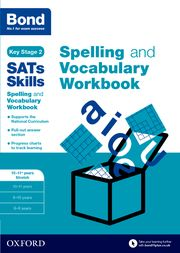 Developed with Oxford Dictionaries, the Bond SATS Skills Spelling and Vocabulary Workbooks are designed to help establish competent spelling and the confident understanding of the words expected by National Curriculum tests.